Two of the Star Wars droids were pitted against each other, and the result was hilarious. It’s a good thing Sphero’s BB-8 droid is really cute, because it sure isn’t speedy. Amazon Launchpad teamed up with Sphero in the midst of the chaos at South by Southwest to pit the droids against each other in a race to the finish line, and let’s just say BB-8 isn’t exactly a fierce competitor. That’s not really the droid’s fault, because you control it using touch in Sphero’s BB-8 app. 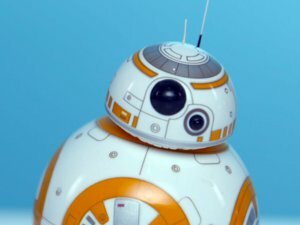 BB-8 is actually incredibly responsive, which is why Sphero is a finalist in the responsive design category at the SXSW Interactive Innovation Awards. The toy, which is based on the droid in Star Wars: The Force Awakens, also responds to 12 different voice commands and expresses emotion in certain situations (like when you ram it into a wall). Mashable House is always a crazy scene during SXSW, but seeing BB–8 put a smile on my face bcause it was one of my favorite parts of The Force Awakens. I’ve definitely seen cooler droids, and BB–8’s $150 price tag is a little steep for a Star Wars toy. But taking a break from the madness of SXSW to watch the comedy of two BB–8s failing miserably at racing was well worth it.